Martha Crone begins her 26th and last year as Garden Curator as the Garden enters its 52nd year. The Friends held their annual meeting in January at the offices of the Burma Vita Company at 2318 Chestnut Ave. West, in Minneapolis. It was voted to give $500 to the Board of Park Commissioners to assist in maintenance of the Wild Flower Garden, the same amount as in past years since the founding of the Friends in 1952. 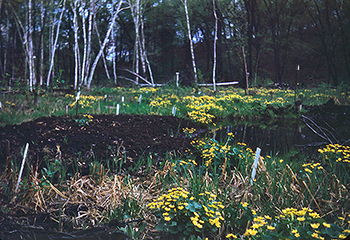 A view of the Marsh with Marsh Marigolds and pool, photographed on May 6, 1949 by Martha Crone. Click on image for a wider and larger view. “Altho the Purple Loosestrife (Lythrum salicaria) is not a native, it is a good plant to grow along streams, margins of ponds or in wet meadows. Especially where the competition is too severe for less aggressive plants to grow. The plant is a long-lived perennial, 4 to 6 feet tall and produces graceful spikes of purple or pink flowers. They bloom during July and August. When once established it is hard to eradicate and will crowd out other weaker growing plants. It can also be grown in garden borders where it remains smaller and does not readily spread. 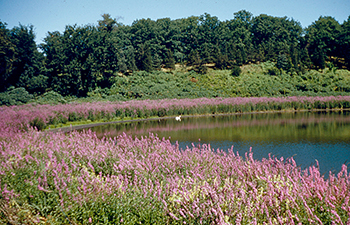 To illustrate the invasiveness of Purple Loosestrife, this photo of Birch Pond, just outside the Garden shows extensive growth; photographed on Aug. 5, 1950 by Martha Crone. Yet in 1958 she was still advocating it. Click on image for a larger version. “Spring in the garden was beyond compare with the twelve varieties of Trilliums, the many violets, Mertensia, Hepaticas, Marsh Marigolds and numerous others, it was a spectacular show. The ferns have never been taller or lovelier. The six-foot tall Pink Azalea was a mass of breath-taking bloom being literally sprinkled with flowers of purest pink, fragrant and with long projecting stamens. The glowing patches of orange Flame Azalea followed." May 17 - Salix caprea, French Willow, not native, no source given. She replanted on April 28 - 2 Ginkgo biloba, the Ginkgo Tree. The first ones from 1948 must have died. 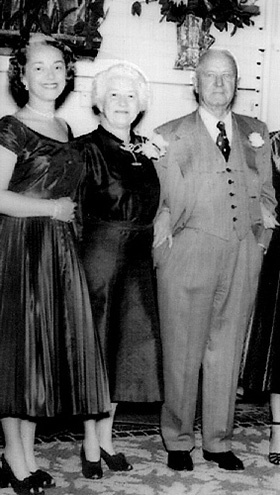 Clinton Odell, shown with spouse Amy and daughter Moana, in the early 1950s at the Odell's 50th Wedding Anniversary. “With the death of Mr. Clinton M. Odell June 4th at the age of 80, the Friends of the Wild Flower Garden have lost their founder, their president and their most devoted and enthusiastic member. All his life Mr. Odell had been concerned with conservation. He was awarded the plaque of the Minnesota Conservation Commission, April 1957, in recognition of his many contributions. His interest in the Wild Flower Garden began in his high school days for Eloise Butler was his botany teacher. For many years Mr. Odell contributed privately to the Park Board's limited funds for maintenance of the garden. He was responsible for development of the Upper Garden, for the fence surrounding this garden and for the employment of extra manpower. Often Mr. Odell could be found in the Wild Flower Garden in his spare time digging weeds and helping Mrs. Crone the Curator with new plantings. He preferred this to playing golf with his friends. With the future of the garden in mind Mr. Odell was instrumental in organizing the Friends of the Wild Flower Garden in the summer of 1952. He was its president until his death. It was his dearest wish that the Friends would guarantee the continuance of the Garden in the event of his death. Membership fees and donations would supplement the allocations of the Park Board and would continue the unique contribution the Wild Flower Garden makes to Minneapolis. Dorothy Binder took over as president and Leonard Ramberg as Vice-President. Donald C. Dayton left the board at the end of the year. Martha Crone wrote about the misleading fall foliage of Poison Ivy and Poison Sumac, causing many people to pick the leaves for displays without realizing the toxicity. She also wrote of cloves, Bloodroot, and which wildflowers to avoid trying to plant due to their requirement for acid soil. In the Garden she noted the Showy-Lady’s-slippers in bloom on June 21, tying 1936 for a late bloom date, only exceeded by 1945 when they bloomed on June 28. She planted another 300 Interrupted Ferns (Osmunda claytoniana) in the new Fern Glen and July 8th was so cold she had to start a fire in office stove. Martha Crone, photo late 1950s. “Plants of many varieties have been purchased and given a start in the garden. Many more have been transplanted from wild areas that have been disturbed or cleared for building expansion, agricultural purposes or swamp draining. Some rare plants have been encouraged and are doing well, such as Galax, Oconee Bells, unusual Trilliums and various Orchids. 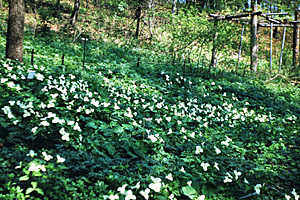 Many notable successes are evident, among them the spreading of the Bloodroot and the Large-flowered Trilliums producing patches of gleaming white in the early spring. The many Hepaticas, Anemones, Azaleas, Rhododendrons, various Lady’s-slippers, Spring Beauty, Violets, Foam Flower and Running Myrtle are outstanding. Included in those plants numbered above were 2,843 ferns that had now been placed in the new Fern Grove, 375 (all Interrupted Fern) just this past season. (3) She did not indicate in the article that she was retiring. In her report to the Park Board, Martha Crone noted giving 13 illustrated slide lectures to clubs, garden groups, school groups and others. She acknowledged the passing of Clinton Odell and the contributions of The Friends . Although this would be her last year as Curator and her last report, she made no mention in the report to the Park Board of retiring - presumably it was well known (2). 1958, with just 16.2 inches of precipitation was the driest year since 1910, and has remained so to this date (2018). (4). Martha Crone records at Minnesota Historical Society. Photo top of page: Images of Martha Crone from various years in her career at the Garden. 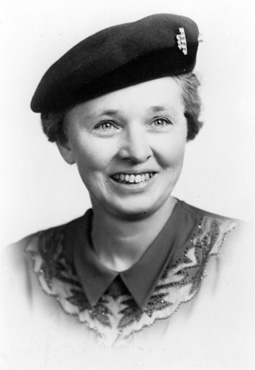 Martha Crone's Annual Report to the Board of Park Commissioners dated Feb. 27, 1959 to Superintendent Charles E. Doell. Vol. 6, # 1, January 1958, Martha Crone, Editor. Vol. 6, # 2, April 1958, Martha Crone, Editor. Vol. 6, # 3, July 1958, Martha Crone, Editor. Vol. 6, # 4, October 1958, Martha Crone, Editor.